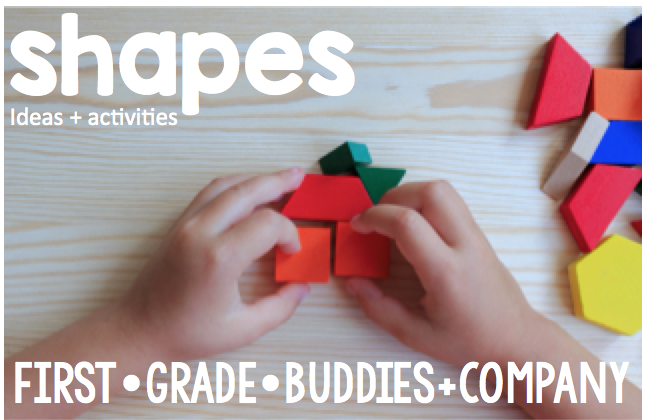 Below are some of our favorite activities when teaching shapes. 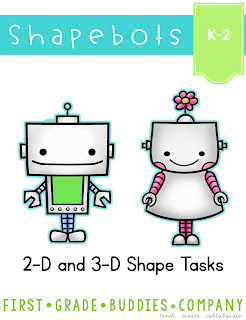 Many of the ideas can be used for 2D and 3D shapes. We begin our unit with a Word Splash! Kiddos can "spot" shapes in the pictures. "I spot a clock, in the shape of a circle." 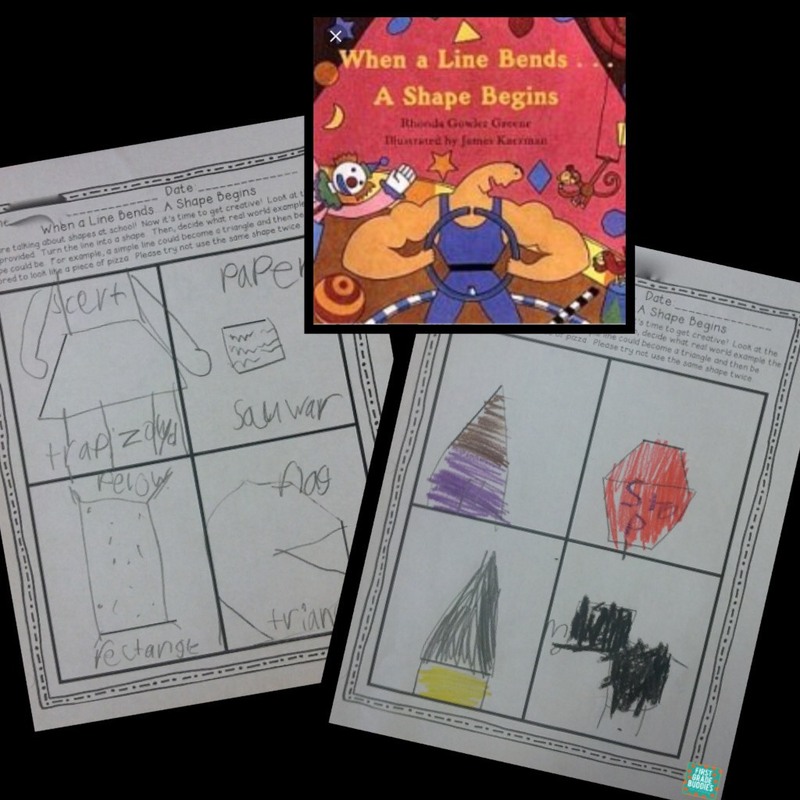 Kiddos give clues about the shape on their partners headband. "Your shape has 2 flat faces." Kiddos can ask questions about the shape on their own headband. "Does my shape have 4 sides?" Grab these shape cards to add to your Headbandz game! Similar to Spot It! above, kiddos can find examples of shapes in I Spy books. It's fun to use a hand lens to "look closer" or a finger flashlight (seen here) to shine on the shapes they find. Students can show the shapes they find with a RECORDING SHEET FREEBIE. Kiddos can build shapes with the tiles. These are GREAT for kinesthetic learners. Magnatiles come in many colors. In this picture, we are using the clear and glow in the dark version. Kiddos build shapes using cards that show the steps. Kiddos build robots out of recyclable boxes and other shapes from home. Kiddos build shapes using toothpicks as the "sides" and marshmallows as the "corners" or "vertices." Kiddos build shapes using rubber bands. As a side note, geoboards are a great tool to use when making composite shapes. This is one of our favorite shape books. In this book, many different things are made out of 1 square. After reading it, kiddos get 1 piece of paper that has been cut into a square. They take the square and turn it into something else. Fun way to spark creativity with shapes. Kiddos walk around the class (or take a field trip around the school) and find examples of shapes. You can give them pointers to make it extra appealing. Another idea is to have students take pictures of the shapes they find with an iPad or other such device. This is a great activity to practice attributes of shapes. After each kiddo completes a page, you can create a class book to display! Grab this activity HERE. After reading this book, students take the lines given and turn them into a shape - something that they have seen at school, home, or in nature. Grab this activity HERE. This packet contains over 40 pages of shape practice - defining vs. non defining attributes, composing shapes, identifying shapes, sorting shapes, shape "mapping," etc. A great common core aligned curriculum companion for shapes! 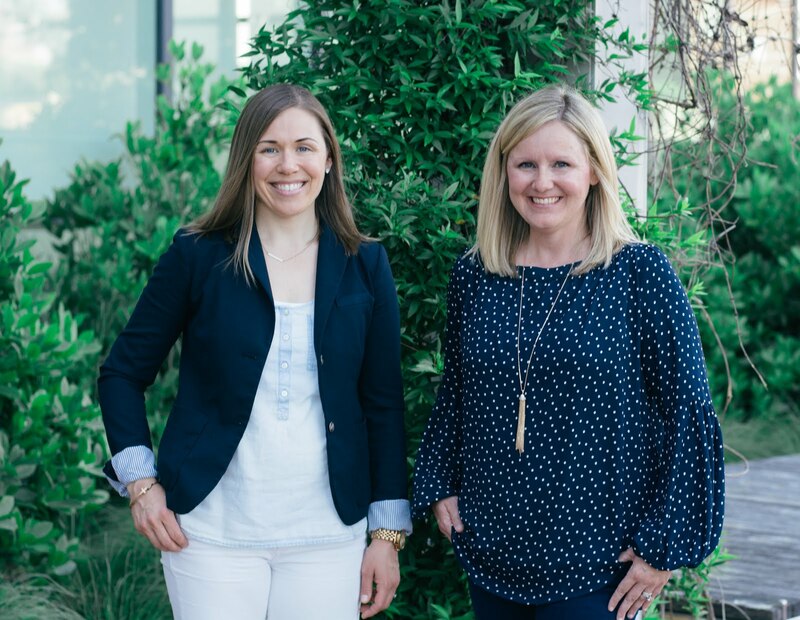 Find this resource HERE. Try some task pages for FREE! 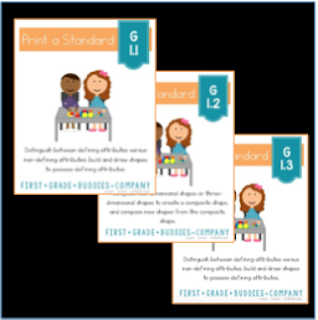 Print a Standard packs contain multiple opportunities for students to practice skills for each of the Geometry standards. They are common core aligned and can be used for independent work, assessments, homework, etc. We have them for each Geometry standard in Kindergarten, 1st grade, and 2nd grade!